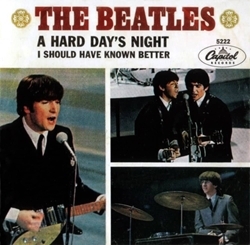 The Number Ones: The Beatles' “A Hard Days' Night” . Beatles Radio: The Beatles, Solos, Covers, Birthdays, News The Fab 4 and More! It’s the single most iconic image of the Beatles’ early days, or maybe of the band’s entire existence. Four young men — grinning and bemused, slightly nervous but mostly pleased with their own ability to whip up this kind of reaction — go careening down a city sidewalk. A tidal wave of hormones follows. Most, but not all, of the fans who go chasing them are girls. They scream and cry, and they’re just as happy and bemused as the actual Beatles. The point doesn’t seem to be catching the Beatles. Because what would they do if they caught them? Instead, it’s to take part in that same moment, that same generational feeling of excitement. The Beatles are there to summon that feeling, to channel it. They’re almost incidental to it.